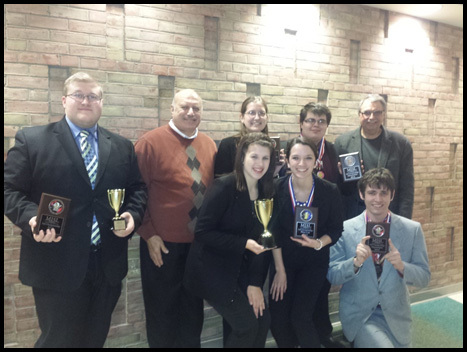 Northwood University Michigan’s Competitive Speech Team recently placed 2nd at the Michigan Intercollegiate Speech League’s Fall tournament in Rochester, Michigan. Cherell Granger - 1st in Rhetorical Criticism and 6th in Prose • Chene Kushmaul and Alyssa Tefend - 7th in Duo. “Public speaking is skill necessary for any successful [Northwood] student. The speech team is truly the best way to improve your skills, all the while having fun and developing relationships that will last a lifetime,” said McKenzie Terwillegar, a Northwood University Senior who is majoring in Business Management and serves as the team’s Co-Assistant Captain and Manager. The group will resume their season on January 17th, 2015 to compete at the Bulldog Battle, hosted by Butler University, in Indianapolis, Indiana. (L-R): Competitive Speech Team members Nicholas Lentz, Mark Marciniak, McKenzie Terwillegar, Kirk Longuski, and Andy Rapp. From left to right (front): Chene Kushmaul, Cherell Granger, and Joshua Gammon.